I've just spent an absorbing time on the BBC News World website. In particular, I did the exercise to see where I fitted into the world's population. While fascinating in itself, the resulting projections were quite frightening for life here on earth, if population growth, and the consumingg of resources continues at this rate. 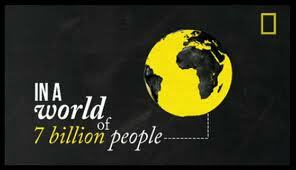 Did you know that the world's population is expected to hit seven billion in the next few weeks? After growing very slowly for most of human history, the number of people on Earth has more than doubled in the last 50 years. All figures that I'll be quoting are based on estimates by the UN Population Division, and all calculations are provided by the UN Population Fund. The exercise I engaged in provided fun and frightening information in equal measure according to my (a) date of birth, (b) country of residence, and (c) gender. On the day of my birth, I was the 2,465,600,020th person alive on earth. In addition, I was the 75,433,461,990th person to have lived since history began. How cool is that? So in 1947 there was a world population of about 2.5 billion, and now 64 years later it will reach 7 billion. That's some growth. Living in the United Kingdom, our population today is 62,156,736. Every hour there are 85 births, 66 deaths and immigration is +23. Our average yearly growth is +0.6%. The fastest growing country in the world is Qatar, with 514 people being added to the population every day. The country that is shrinking the fastest is Moldova, whose population is decreasing by 106 people every day. The average life expectancy in the United Kingdom is 79.6 years, with the female average of 81.7 years, and the male average of 77.4 years. The country with the highest life expectancy is Japan, with 82.7 years. This is put down to a combination of a healthy diet and good public health provision, which includes regular check-ups. The country with the lowest life expectancy is the Central African Republic, with 45.9 years. This is explained by a number of factors, including poverty, conflict, poor access to health care and the high prevalence of Aids. I was on the website about 30 - 45 minutes, and it told me that in that time,the world's population had grown by 1,799 people. So what's next? According to the UN Population Fund the global population will continue to increase, but at a slower rate of growth, reaching 10 billion by 2083. Working-age people will be supporting increasing numbers of older people during the next decades. By 2050, there will be just 2.2 people of working age supporting every person aged 65 or older in the developed world. In Europe, this will drop to just two. It is estimated that the richest countries in the world, which includes the UK consumes double the resources used by the rest of the world. And in a statement that quite frankly staggers me; the UN estimates that if current population consumption trends continue, by the 2030's we will need the equivalent of two Earths to support us. We hear much about climate change and global warning, but unless I've been missing it, what about the whole matter of population growth, and the consumption of the Earth's resources? In reading George Monbiot's blog in the Guardian on-line today, I'm apparently one of the group of people who are called "Population Obsessives". Many comments on his blog see the UN statistics and projections as "Population Red-Herrings". To Monbiot, the real baddie is not population growth but consumption. How you get people to consume less in the developed world is not said. Surely in this imperfect world, a much larger population leads to greater consumption. To my simple mind, population growth and consumption go together as problems to explore. Even if UN projections prove to be 10% out, or 20% out, the figures are astounding, and I for one would prefer them to be taken seriously. If that makes me a population obsessive, then so be it. You may not agree with the whole content of this video, but it is worth considering.